Fox News presents coverage on the Austin, Texas, Lady Bird Johnson Wildflower Center’s experiments in energy conservation with native plants. 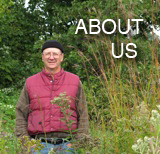 Allow yourself a half hour for the following video, a new episode of “Central Texas Gardener” from Public Television. Bluebonnets (Lupinus texensis) and Pink Evening Primroses (Oenothera speciosa). From monitoring the volume of online activity related to native plants (which I do multiple times every day in order to provide you, dear visitor, with all the best highlights), I know that these new videos from the Lady Bird Johnson Wildflower Center in Texas are representative of citizen action in hundreds of communities throughout the U.S. and in other countries, too. The message has taken a full generation to get disseminated; it’s in a phase of enculturation now. In one more generation, we will no longer need to recite the list of values provided by locally indigenous plant species. It will be understood. This nice little vid was posted this past week by the Lady Bird Johnson Wildflower Center. I’ve requested they provide a follow-up of this interesting-looking planting arrangement.